I had to stop and really think about this…I’ve been on the hunt for vintage finds for quite a while…and though there are several treasures I have discovered over the years, it finally came down to the one item that I have had the longest and has served me well over the years…my vintage Singer sewing machine. Here she is in my workshop studio - she’s a beaut! minty green, curvaceous and weighs a ton! I have always loved to sew…my mother taught me when I was in grade school. Her father was a tailor with his own shop, where my mother learned to sew. When my siblings and I were small, Mom made all our clothes (and sewed the curtains in the house and reupholstered the furniture). When I was in high school, she worked at the Milwaukee Repertory Theater in the the Costume Department - so this woman knew her way around a needle and a spool of thread. a sewing inspired vignette in my office…an old Singer machine body and a collage homage to my mom (seen here at age 26) and our mutual love of sewing. When I graduated from college and moved into my first apartment, one of the first things I wanted to buy was a sewing machine, because I was sewing my own clothes and would soon be sewing curtains, pillows and table linens (no, never tackled any reupholstering!) I walked downtown to the local fabric store to see what was available. All lined up in a neat row at the front of the store were several gleaming, brand new, shiny models…but that’s not what I wanted. 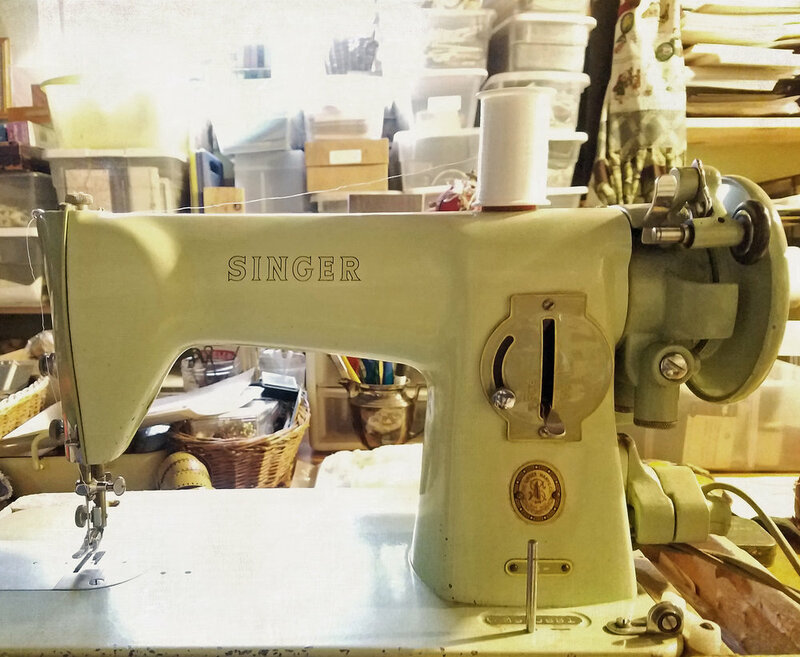 My mother’s machine was a trusty straight stitch Singer, in its own cherry cabinet. There was nothing shiny about it but it was well loved and well oiled; it ran flawlessly. I asked if there was anything else they had…perplexed as they were, yes, indeed they had an old Singer model in the back and I could have it for $20 - I jumped with joy! I paid my bill and grabbed the handle of the carrying case for the machine and stopped…this was no lightweight…the body of this machine was cast iron. I did manage to walk the six blocks home with the machine, but wished I had driven. Nowadays I can drag the machine upstairs if need be, or out to car if necessary but it stays parked just fine on my studio table for the majority of the time. Over the years I have spent countless hours and hundreds of miles of thread creating with my machine. As I progressed with my professional career, I didn’t have time to sew my clothes anymore but still crafted gifts for friends and added decorating touches to the household. The itch to do something more creative and artistic with my life began gnawing at me about 25 years ago…I had spent plenty of years in non-profit management and felt it was time to move on to the next phase of my life. When I had the opportunity to move to London, I took my sewing machine with me - along with 8 Rubbermaid containers of fabric and art supplies - this was my chance to figure out just what would scratch that creative itch. The first challenge was finding the right electrical adapter but the neighborhood iron monger helped me out with that. I visited exquisite fabric and findings shops - and of course just swooned over the Liberty of London store! I was inspired by an artisan fair where I saw several people sewing up notecards and banners…I had never thought about sewing paper (a brilliant light-bulb moment!) So I spent a couple of months trying out ideas, both with using vintage fabrics in constructing decor items and sewing fabric onto notecards…which was the genesis of my design company. For a number of years, I had a successful card line that incorporated sewing with paper and simple graphic images, usually sourced from vintage ephemera or recycled junk mail. I sewed each and every card…until I realized that I was hampered by what I could do myself and it was not feasible to hire help. So my design direction changed…and I explored other combinations of sewing with fabric and paper. Which led me to where I am today, focusing more on the original collage creations I construct (sometimes with sewing) and a card line that encompasses my love of all that is vintage, captured in photographic moments. Sewing paraphernalia is one of my oldest and most consistent vintage collections…nothing accidental about it at all. I have a fondness for all that has survived through the years, touched by a multitude of individuals. I find a soothing rhythm to sewing that calms my nerves and quenches my desire to work with my hands. My machine has been idle for some time while I’ve been busy with photography and assemblage but I’m itching to get back to it. Even though I have drastically pared down my textile supply (yes, I was a fabric hoarder galore!) I still have plenty. I’m taking a fabric collage class and also designing a baby quilt for a recent family addition. My mom passed away 10 years ago. I didn’t make a fuss about most of her belongings that were left behind…but I did want her sewing machine. It sits in its beautiful cherry cabinet in my office. I think it’s time to pull it out.